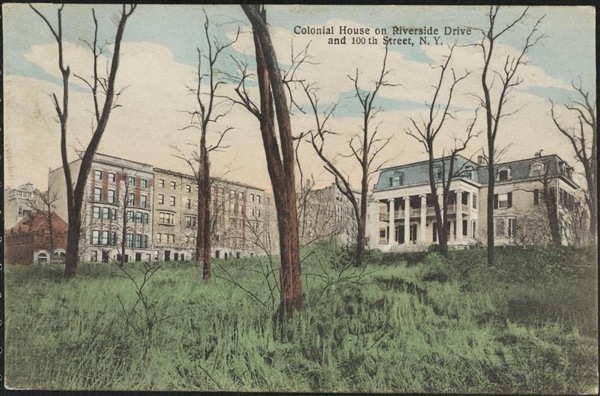 NEW YORK TOURS BY GARY : The Upper West Side's "Colonial House" in Color. The Upper West Side's "Colonial House" in Color. Often referred to as the "Colonial White House",probably because of the columns and the colorof the house, this mansion was important enough to merit it's own postcard. Built by the dry goods wholesaler William P. Furniss, the house was on land once owned by Charles Apthorpe. Apthorpe's estate once upon a time stretched from 99th street down to 81rst street, from Riverside Drive to Central Park West. In 1764 he sold a large chunk to Jacob Stryker. This piece included 96th street and the cove that used to be there was called Striker's Bay (spelling's and politician very often are corrupted. 100 years earlier the land was owned by Theunis Idens van Huyse, a Dutch tobacco farmer who once was the largest landowner on the island of Manhattan. The Furniss estate briefly extended up to 104th street and Riverside Drive, and it did extend all the way to the edge of the Hudson River, but over the years lots were sold off or given away to his children and the construction of Riverside Drive cut off the river access. Furniss and his wife had passed away by 1880, their daughter Margaret sold the lots south of what is now 99th street to John N. A. Griswold of Newport, Rhode Island. Then in 1899 Griswold sold the lots, which had remained undeveloped during his ownership. This left a still ample piece of property for an already vastly different city from when the house first went up - the entire block from 99th street to 100th street from West End Avenue down to Riverside Drive. This is a piece of the 1867 map and the house is clearly indicated on its eventual plot / block of land. 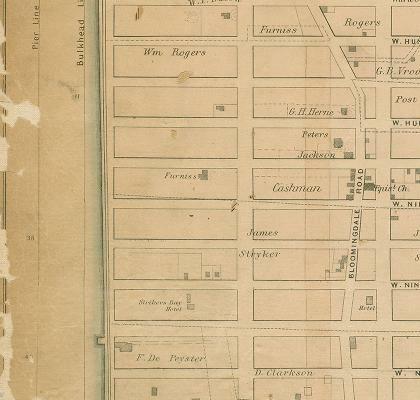 On this map, the only indication that the estate stretched up to 104th street is a piece of property labeled "Furniss" on what is now the middle of West End Avenue at 103rd street down to the Bloomingdale Road / Broadway. Eventually the old Furniss mansion had become an artist’s colony of sorts. A playwright by the name of Paul Kester lived in the house during its final years and would very often hold rehearsals in the big living room. Gertrude Stein lived in the Furniss house from February to late spring 1903. The Furniss house finally gave way to the ever growing city, apartment house construction and the old saying "the land is worth more than the house". The Old Colonial White House" was torn down in 1904.